« Day 476 In Beijing: Trip To Xian, Terracotta Warriors, Part 6. Day 477 In Beijing: The 3rd Western China Multi-national Sourcing Fair. Jill, the Kaiwai Winery owner/winemaker and me. The whole reason for this trip, paid for by EACHAM, was for Jill and me to go to a sourcing fair. Now, we weren’t even sure what a sourcing fair was, but we were told the trips were fun and, so far, that had been proven true. Basically, we got a trip, by train, and got to stay in a 5 star hotel, for free. The tickets and transport to the Terracotta Army cost us about 75 USD, total, and that was a deal considering this trip would have cost us about 400 USD if we paid for it ourselves. Therefore, we were obliged to go to the sourcing fair and meet the vendors. Our vendors were chosen, in advance, by what we were interested in doing and learning about, so we were set up with some interesting machine companies (no idea what we were able to build and I’m pretty sure semi truck axles are not on my holiday shopping list. It was still interesting to see how they were assembled). They actually did a very good job of putting us in contact with a few wineries and a brewery. Along with Jill’s main website and business, SF Tourism Tips, Jill has a second website, All About Red Wine, it was quite useful for her to talk to the winery owners, and winemakers, and discuss how the wine is made here and what they are doing with it. Our favorite winery, Kaiwai, and winemaker, asked us to hang out with him and told us all about what he did and how special it is to him. Everything is organic and handmade. They even has some other their own grape varietals, one named “Weibei” that is delicious. 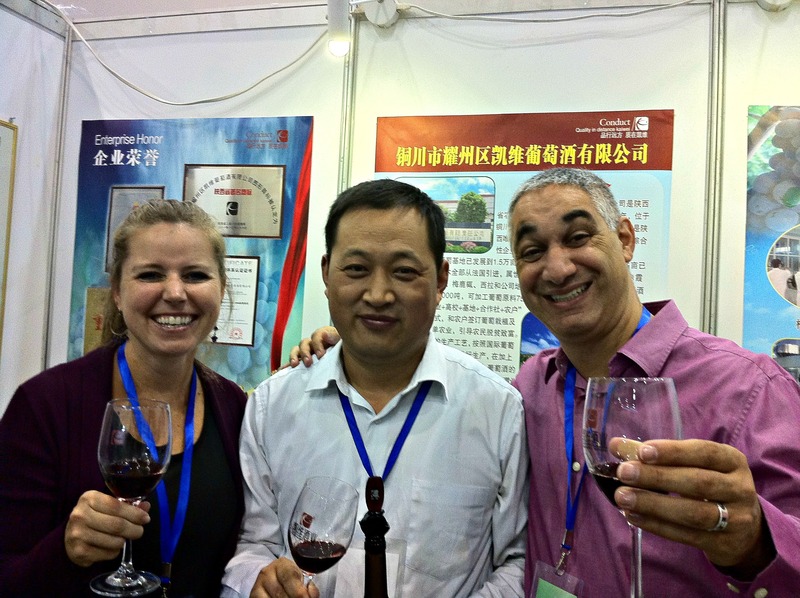 The owner asked us to come and visit his winery next time we are in Xian and, if we ever make it back up this way, we definitely will! As mentioned before, we were also given two translators, Miranda and Lizzy, who were fun, smart and very cute. We made sure they were able to taste the beer, and wine, and they seemed to enjoy spending time with us. Miranda is wearing the glasses in the picture and Lizzy is not. We hope they come and visit us in the USA when we return home so we can return the favor and tour them around San Francisco!